This is it: a smoked beef shoulder clod (a.k.a. Chuck Roll) recipe that is nothing short of magnificent. It’s one of those long cooks -20 hours!- that are definitely worth every minute. First, the basics: the shoulder clod is, as the name suggests, the shoulder of the animal.There’s a lot of great taste in this piece, as it includes flat-iron steaks, broil, shoulder stakes and shoulder roast. Preparing and cooking the shoulder clod is in some ways similar to cooking a brisket. Start by trimming down the fat on the outside of the meat, leaving just enough on there so it can render down during smoking. Inject with some Johny’s French Dip, using a stainless steel meat injector (one injection per inch). Once ready, cover the meat with your favorite savory prime rib rub. If you want to make your own instead of buying, mix some kosher salt, ground garlic, ground onion, pepper, paprika, cracked rosemary and sugar. After you have covered the meat with a layer of the rub, put it in a large ziploc bag and place it in the fridge for 24 hours. Preheat your smoker to 225°F before placing the beef on the pit. Target internal temperature is somewhere between 170-180°F, and the whole cook should take 20-24 hours. After 4 hours, flip the beef and mop with some Johny’s French Dip. Repeat every 4-5 hours. You might notice that at some point (around 10hours) internal temperature hits a “wall” and stops rising. Do not panic- let it ride that and temperature will eventually start rising again. 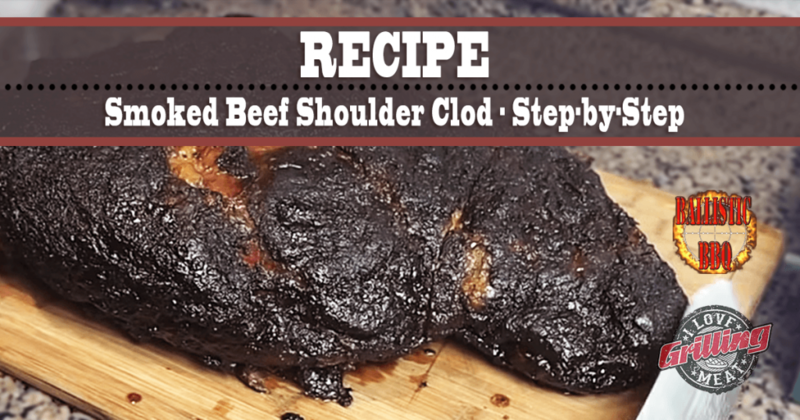 Pull the shoulder clod and let it rest for a bit. The point will be the most tender part, and you can even use it as pulled beef for sandwiches. Slice the rest and serve. The clod is the lower part of the chuck, the roll is the top part by the neck and back. Two different parts. Can you shred it like pulled pork?